Elliott has just turned twenty-three, and still isn’t completely sure how being a man works. And now his comedy partner's just left him. Therapy is expensive so instead this show exists. 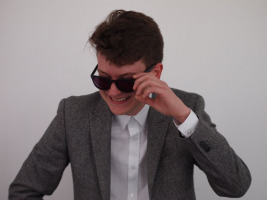 Join bumbling nerd, delicate lover and Cambridge Footlight Elliott Wright for a brand new hour of surreal and acerbic stand-up, as he delves into masculinity, relationships, self-identity, heartache, anxiety and the endless turmoil of looking like a sainsbury’s basics version of himself.